Just joined the Forums. Renovated my family room last month (bought house a year ago) by myself during evenings/weekends. Wife wanted it done for Christmas! Behind fireplace grills are M22v3 bookshelf and VP150 v3 center channel. At rear of room are a pair of QS4 v3 surrounds. Mirage sub still going strong. Love the speakers and sound. Wanted a clean, hidden appearance. Still waiting for new furniture/area rug. Before and after pic. 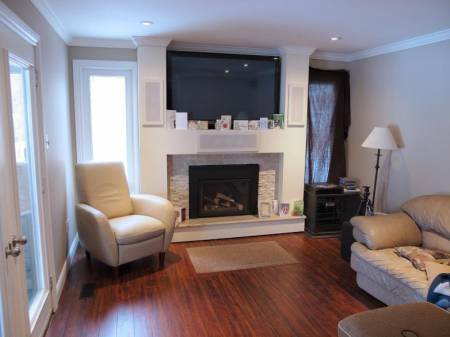 Note: Before pic was real estate photo before buying house, certainly not our taste! Hard to believe it is the same room! I would have thought using the in wall M22/VP150 would have been preferable, using bookshelf speakers in an enclosed space like that usually isn't recommended, I will take guess that these were speakers you already owned. Yes owned the speakers prior to reno. The 150 is not ported at back, it is a sealed box. For the m22 bookshelf I made the fireplace enclosure deep enough to allow about 3 inch space from back wall and secondly although it cannot be seen in the pic (or actually viewing the fireplace surround) I left a 2 inch open gap running vertically (about 3 feet tall) on the inside part of column behind the tv so that the enclosure is not sealed. It works, the speakers sound great, they do not sound as if they are enclosed. That's a very nice renovation and very clean install! good thinking with the enclosure build, truly is a new room now. Nicely done, modern but not over-the-top. What a great renovation! You must be thrilled with it! One of the Axiom staff/family, Joe Vassallo, also had speakers built into columns in his home theater and it worked really well in his room. Great thinking!